The illegal gambling game in Brazil known as jogo do bicho, or the animal game, occupies an important, if shady, place in popular culture. In the run-up to Carnival in February, Rio de Janeiro police have been targeting alleged gambling chiefs in an operation called Dedo de Deus, or Finger of God. Standing for his police photo in Brazil's regulation green prison uniform, Aniz Abraao David cut a forlorn figure. Last year, he was celebrating in style with the great and the good of Rio de Janeiro as honorary president of the Beija-Flor samba school, which won Carnival. Among them was Roberto Carlos, one of Brazil's best-loved singers, whose life was the theme for Beija-Flor's victorious parade. But on 11 January this year, Abraao David, or Anisio as he is widely known, was arrested for driving while accompanied by an armed security gang. Police say they are also investigating him for money-laundering. "I would like to know what I have done that is so bad to this city," he said as he was taken into custody. The move against Anisio was part of yet another crackdown against the suspected ringleaders of the multi-billion dollar jogo de bicho. Although involvement with jogo do bicho is considered a minor crime in Brazil, the bosses, known as bicheiros, are wanted in connection with offences that include money-laundering through the samba schools. Anisio's detention followed a previous failed attempt in which helicopter police swooped on his penthouse in Copacabana while he was out. Police discovered a luxury apartment with a home gym, beauty salon, Japanese garden, artificial lake and a swimming pool with the image of the hummingbird, the symbol of the Beija-Flor school, painted on the bottom. Anisio has been targeted before. In 1993, he was found guilty with several other bicheiros of criminal conspiracy, including ordering killings. Anisio, who denies all the accusations against him, served just a few years in jail before being released. Jogo do bicho might be technically illegal, but that does not stop vendors on street corners all over Brazil selling tickets, and the results are even announced on the radio. It uses a complicated system where players choose a selection of numbers, which correspond to 25 animals. Gamblers can potentially bet less than one real (60 cents; 40 pence) and in some versions, enjoy supposed odds of up to 50,000. It enjoys a status as a part of Brazilian culture, as entrenched as Carnival itself. But prosecutor Angelica Glioche says this view of the game as harmless is deeply misguided. "The numbers game has not been innocent for a long time," she said. "It has a turnover of billions, and is linked to crimes including money laundering, murder and corruption. The results are fixed," she said. Among other evidence uncovered by a wiretap investigation was the use of electronic machines thought to fix games by reducing the possible number of winners. 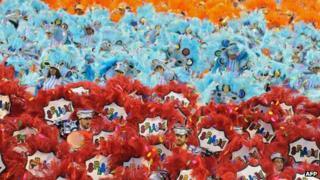 Rio crime reporter Jorge Antonio Barros says the bicheiros, who have been around for more than 100 years, are a kind of mafia and have historically sought to associate themselves with Carnival to disguise this. Bribing the authorities - police, judges and even journalists - has been another way to conceal the truth from the public about the dark side of jogo do bicho. The last big police operation in 2007 uncovered a large network of pay-offs, and even allegations that the result of the carnival parade had been fixed. Mr Barros says: "The Carnival of the samba schools of Rio is a global spectacle, which sustains the tourism industry. It's great art, but there is also a criminal element. "Who could imagine seeing the king, Roberto Carlos, one of the greatest legends of Brazilian popular music, on the front page of a newspaper being hugged by a bicheiro? There is no suggestion that Roberto Carlos is involved in any of the illicit businesses allegedly run by Anisio. Mr Barros says the link between the game and Carnival goes back to the 1930s, when the first bicheiro, Natalino Jose do Nascimento, started acting as a sponsor to the samba schools. Others followed, in order to gain social acceptance but also to launder money. Mr Barros does not believe this connection is likely to disappear any time soon, despite the scale of police operations like Dedo de Deus. "(Rio) Mayor Eduardo Paes even promised in the election that he would bid to run the Carnival parade, but the matter was soon forgotten and no-one's tried to remind him of it," he said. Brazilians now play other lotteries such as the Mega Sena which are legal and are taxed, leading to a number of calls for the legalisation of jogo do bicho. Some argue that this could act as a kind of amnesty for those crimes already committed. Those in favour believe legalisation would cut out the violence and other criminal activity such as money-laundering associated with the game. Rio lawyer Andre Barros says: "I'm in favour of legalisation. Jogo do bicho is already socially accepted and played openly, so it is hypocritical for it to remain a crime. "At the moment, the game employs the unemployable - ex-prisoners, for example - who sit at their table for up to 10 hours at a time without a break, under difficult conditions. "If it was legalised, they could have the same rights as other workers. "It is a game enjoyed by the poor and is part of daily Brazilian life. But people make a lot of money while it remains illegal so no-one truly has any interest in legalising it."